Our guest blogger today is someone who has huge credits of honor to boast of in the travel blogging community. One look at her ‘About Me’ section and you’ll know why this introduction is the longest that I have written so far (and I could still add so much more!). What once began as a chance trip with friends to London in 2008 sometime during her graduation went on to snowball into something more meaningful, something that turned her life to a new direction. A Master’s degree in travel writing later, she found her passionate trysts with adventure and writing creating magic, igniting a spark which has today radiated into a beautiful world known as “The Great Affair”: Her travel blog inspiring one and all to fall in love with the world. She is one of those travel bloggers who believes in digging deeper in her travels, and consequently into her own self, a fact which is very well reflected in her blog where she shares pieces coming out directly from her heart. She has a long list of feathers to display on her blog including an array of freelancing projects and an esteemed feature in The “New York Times” among many others. Recently, she topped all this up by bringing out her memoir titled “The Only Courage”, a gripping read of her life as an adventure and a renewed sense of understanding of falling in love with the world. Interestingly enough, all through my interactions with her across Twitter and blogs, I have been in complete awe of her writings. But what really got me attracted was her amazingly rooted and down to earth personna, an absolute delight to talk with – to converse, to discover and to learn. Besides being a writer par excellence, a traveler for the soul and a wonderful being at the core, she is an awesome sketch artist as well - painting and sketching on the move. Now, isn’t that a truly wonderful talent to have? It’s an absolute honor as I present before you our very special guest for the evening: Candace. Candace Rose Rardon from The Great Affair! 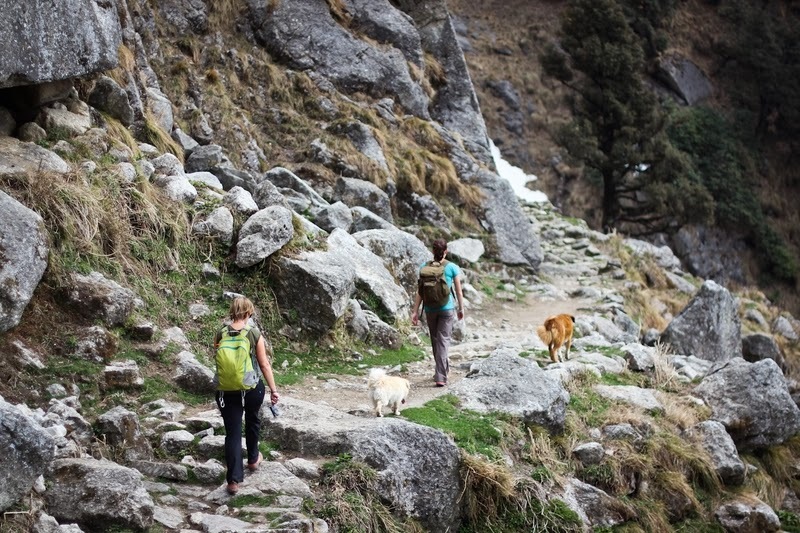 Here, she takes us along on another one of her chance trips, this time a trek to Triund in an upper suburb of Dharamsala. Read on. I had just one regret as I prepared to leave India earlier this year. Although I’d gotten as far east as Shillong, as far west as Jaisalmer, and I’d stood on the southernmost shores of Cape Comorin, I regretted never going north of Delhi. 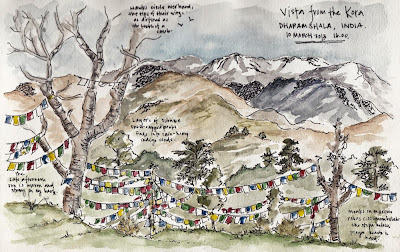 But then a serendipitous invitation from my friends Kim and Wendy: They were heading to Dharamsala, an old hill station in the Kangra Valley of Himachal Pradesh, and invited me to join them. 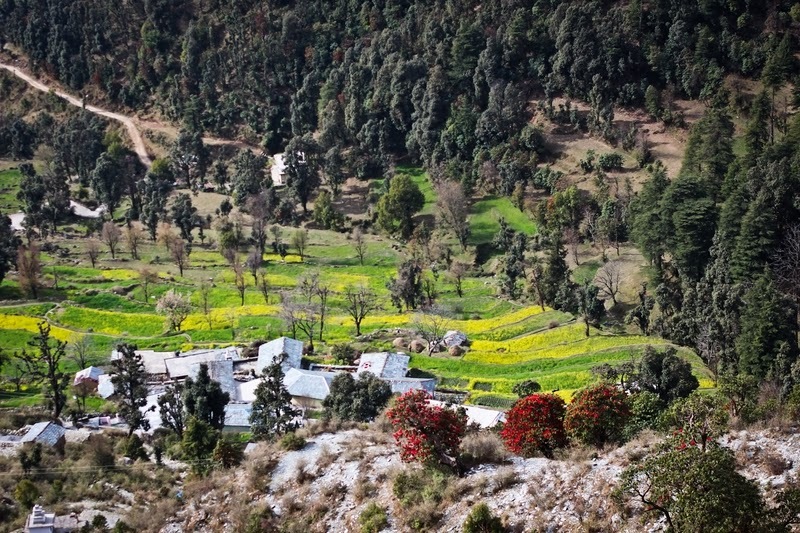 The trip made little sense logistically – I was living in Goa at the time, and would be flying out of India from Chennai, but a final jaunt north to the Himalayan foothills was too tempting for this traveller to resist. Our weekend in Dharamsala was as serendipitous as our decision to visit. We had unknowingly arrived in time for Tibetan Uprising Day, which commemorates the 1959 revolt in Lhasa against the Chinese, and were able to attend a ceremony at the Dalai Lama’s temple complex and later join a march of protest. Both were a sea of red, blue and yellow Tibetan flags, fluttering in fierce spring winds. The next day, after the chants and cheers of the protest had died down, we decided to spend our last full day in Dharamsala hiking to Triund. 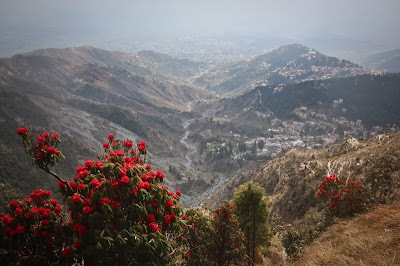 The hike is a popular one among visitors, as it can be done in a day, and as the path led us higher into the hills and even across the snow line, I was grateful to serendipity for letting me experience this corner of India before leaving. The trail itself is around nine kilometers (six miles) long, and begins right in McLeod Ganj – an upper suburb of Dharamsala where most visitors choose to base themselves. 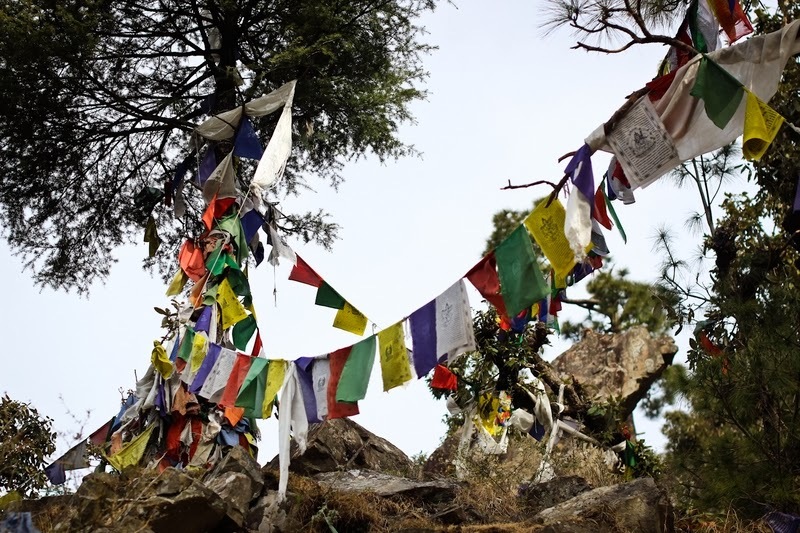 Strings of prayer flags along either side of the path are a welcome presence – not only for the color they bring to the scene, but for the reminder of what the entire Tibetan community in Dharamsala is still waiting and hoping to achieve. Triund is located at 2,842 meters above sea level (or about 9,325 feet), meaning that those climbing from McLeod Ganj will gain about 800 meters during the hike. Each new bend in the trail brought another stunning vista of the valleys and terraced fields below, but what I grew to look for the most were the rhododendron trees, their vibrant red blossoms impossible to miss. One of the things I love most about India is that a cup of chai is never too far away. 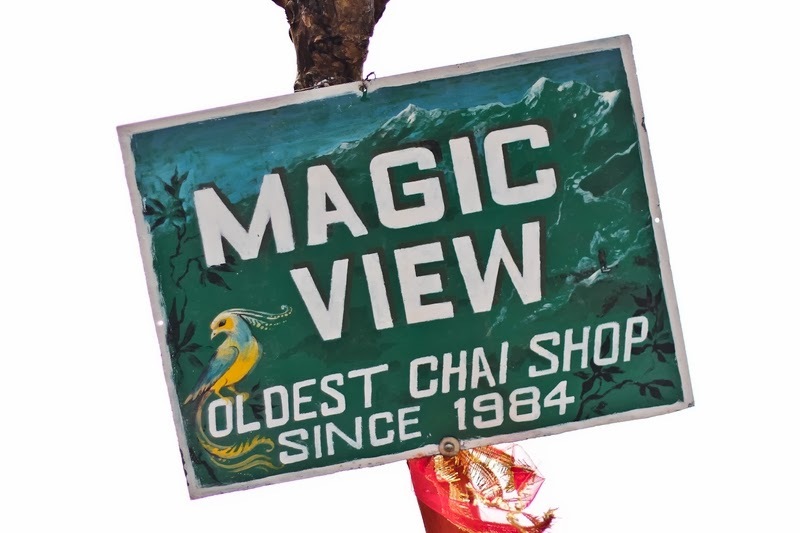 Among the handful of tea shops located along the trail to Triund, we chose to stop at a little place called Magic View. After a few cups of steaming tea and a chance to rest our feet, we continued our journey and soon crossed the snow line. Morning sunlight reflecting off the silvery slopes was a beautiful sight. 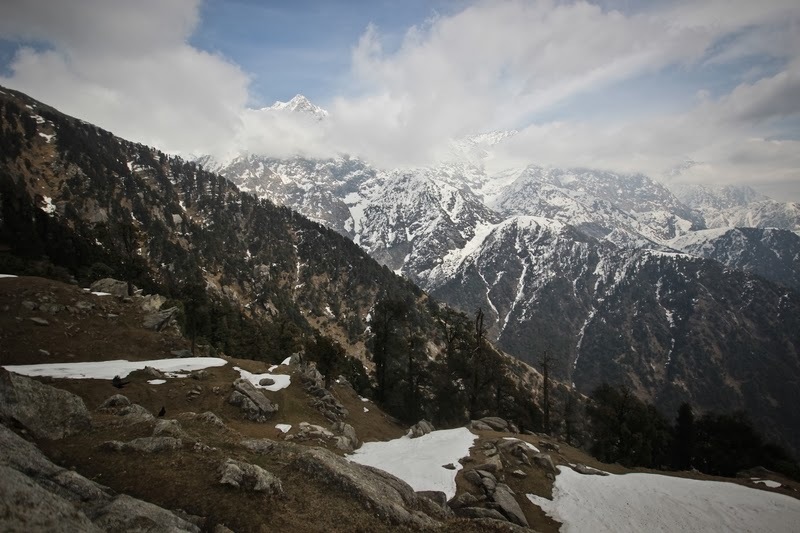 Finally reaching Triund, we marveled at being surrounded by the snow-capped Dhauladhar range, and were glad the clouds had parted just enough to give us a glimpse of Mount Dhauladhar, located at 4,800 meters above sea level. 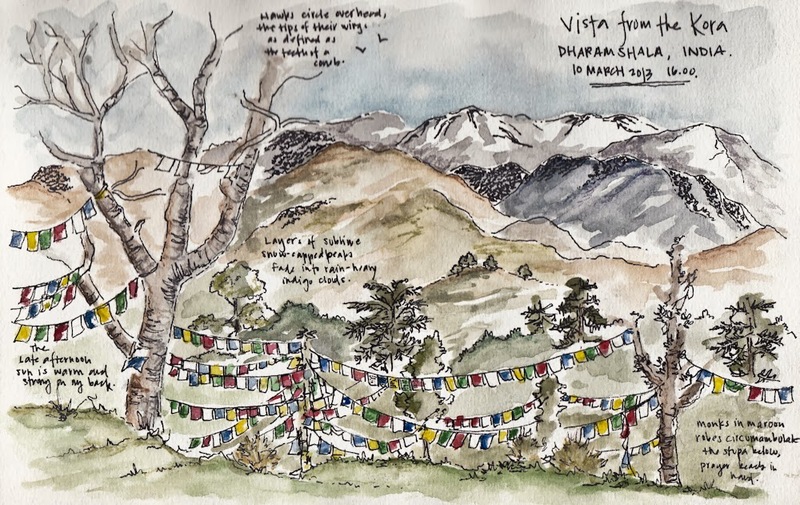 After a quick lunch, we started the trek back down to Dharamsala, but what I found myself wondering about was what if we had kept going – even farther into the hills. 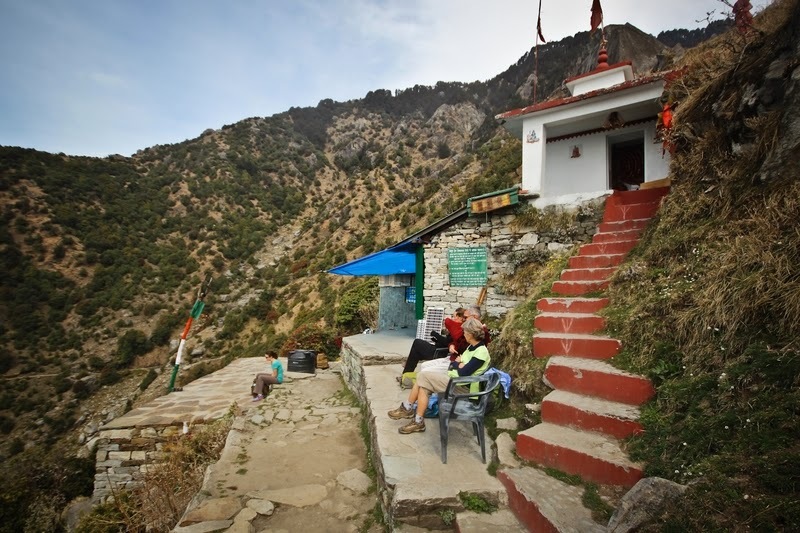 Dharamsala is about 480 kilometers north of Delhi, and 200 kms northeast of Amritsar. It’s a 1.5-hour flight from Delhi, or you can take a 9.5-hour train (such as the Jammu Mail) from Delhi to Chakki Bank, where you can either hire a taxi or catch a bus for the remainder of the journey (both options should take around 3 hours). Arti, Great to read the guest post by Candace, Beautiful photos & post. Thanks for sharing. I hope ti visit this beautiful place. I hope you get a chance to as well, Indrani! Dharamsala will always be one of my favorite corners of India. It was indeed, Seeta! And I'm so glad you second my thoughts on chai in India :) I've been in serious chai withdrawals these last few months since leaving India. Thanks, Anita! I definitely can't wait to explore more of the Himalayas one day - do you have any favorite spots you recommend visiting? So glad you enjoyed it, Vineeta! Thank you, Prasad! 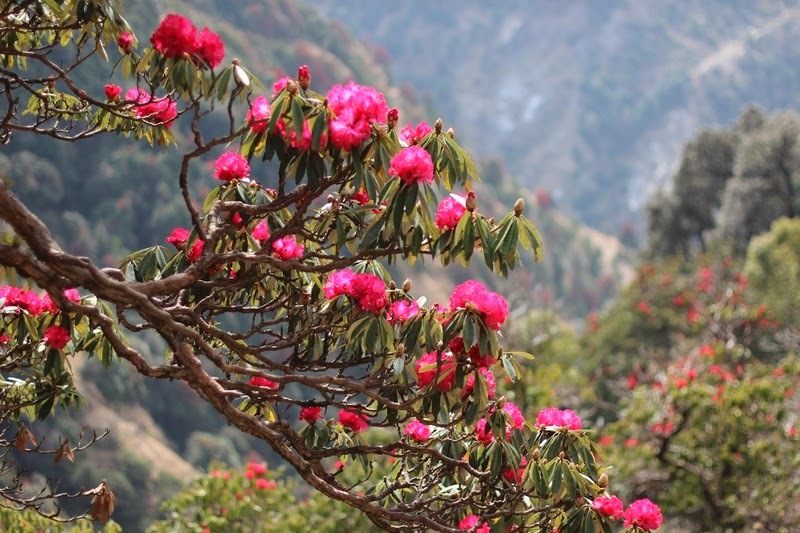 The rhododendron blossoms were absolutely one of my favorite things from that day. 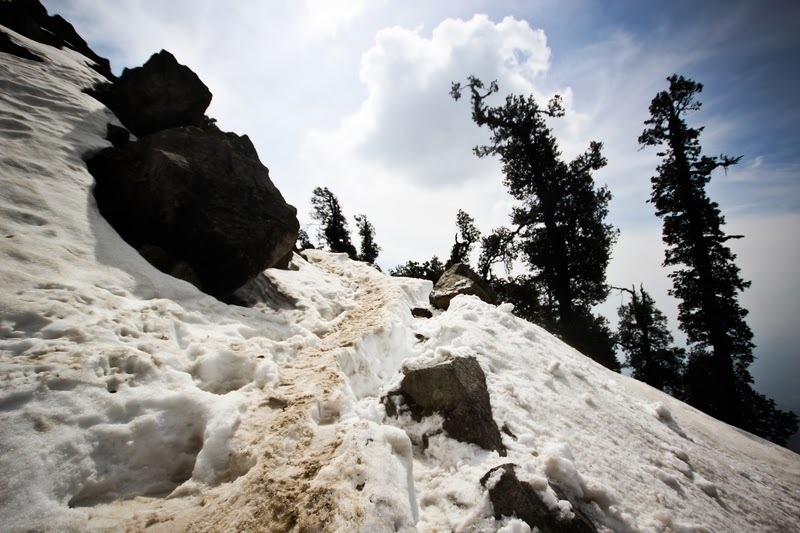 I missed out on this trek last time when I went to dharamshala. I hope to visit this place sometime in future.Nice post ! I'm sorry to hear you weren't able to make the trek to Triund, Shwets, but fingers crossed you get there next time :) Thanks for reading! 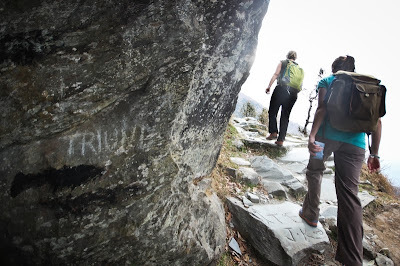 Nice article on triund trek. 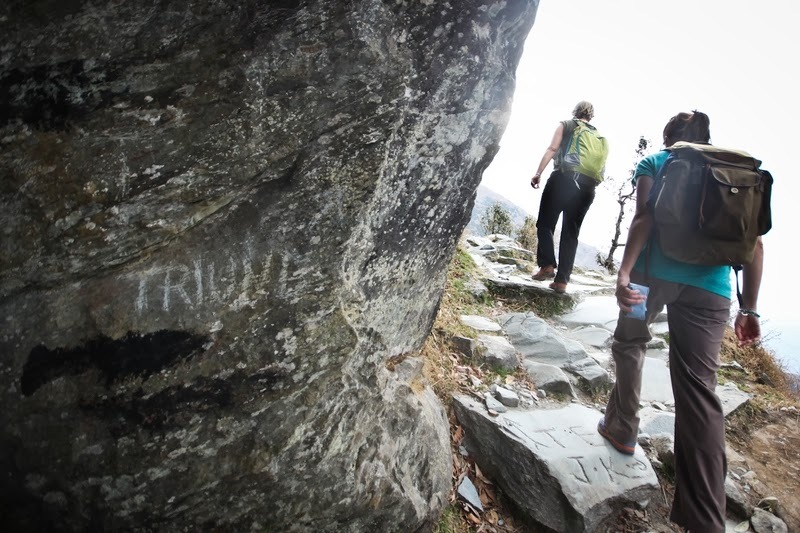 hey Arti, long back I read abt this Plce Triund and since then this word was in my mind though I forgot rest of the details abt this place. except that it is in Hp. lovely post. The photographs are awesome. Will definitely put it in my travel plans. What a great trip! And lovely shots too. 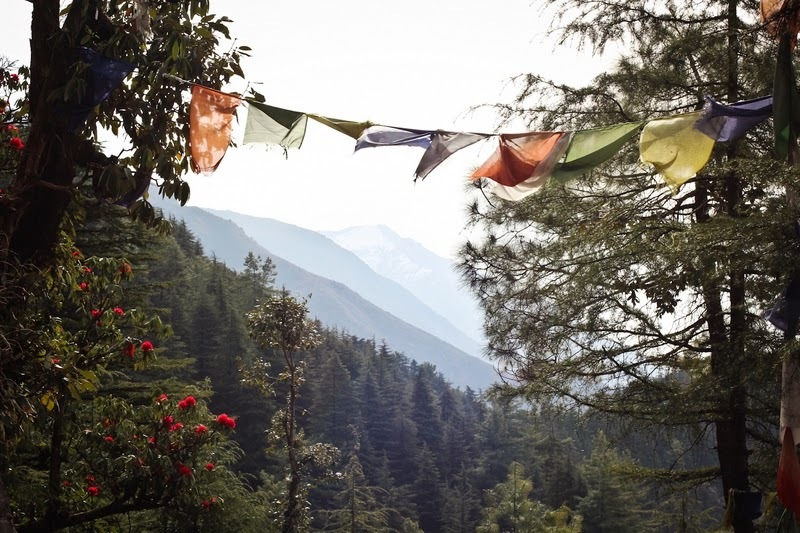 Dharamsala was a beautiful unspoiled place when i visited it--thanks for having me see the place again. That looks like a decent hike! What a beautiful scenery. That makes me wanna come back to Tibet! The hike certainly had me breathing hard at points, Agness :) But thankfully the views at Triund were worth every step - I can't recommend it enough. And have you been to Tibet before? My short time in Dharamsala definitely had me wanting to visit there! Glad you enjoyed the story, Nasreen! 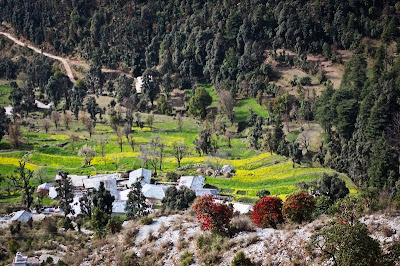 This trekking route is awesome! I’d like to sit and meditate at such a fabulous observatory (No. 9 photo) in person. Thanks for the introduction of this post. The chai shop would be a perfect place to mediate, Yoko - I know I would have loved more time there myself :) Hope you get the chance to walk this trek one day! Yes her photos and words certainly makes one want to visit this place. But places like that I have a special place in my heart for. Something draws me there. Thanks for sharing her travel blog. I'm so glad to hear that, Carrie! And I know what you mean about this kind of place - there's something truly magical about them, isn't there? 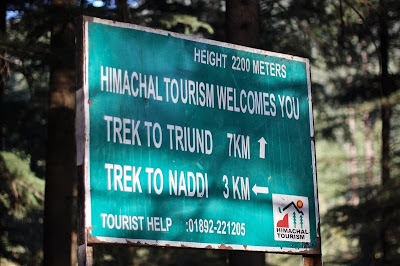 I hope you'll get a chance to visit Dharamsala and Triund one day. This is the kind of travel I'd like to do, if I had another life...If I knew better, this would have been the path I chose. Great post gals! 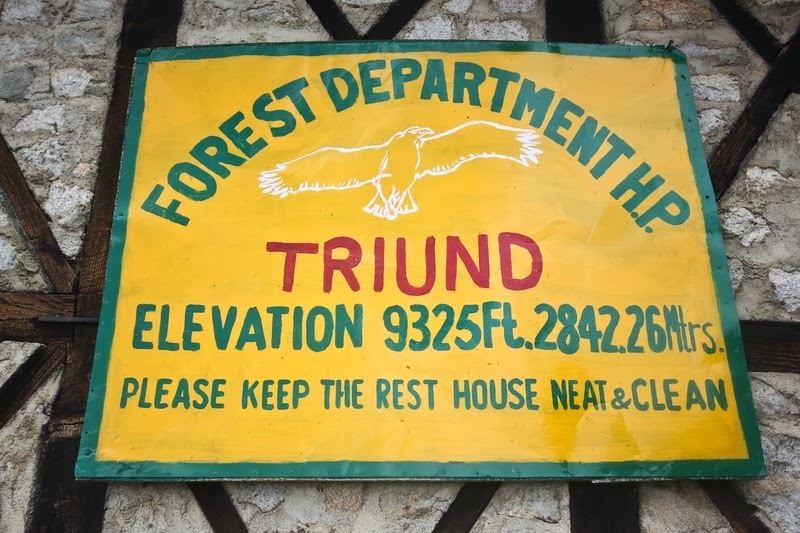 hey mice description of even nicer place, i had visited it twice but i would like to suggest that one should stay at triund at night and if you are lucky to have a clear sky you can have your own planaterium for a night..
Hi are there any places to stay up at triund? Are there washrooms?